A friend sent me this documentary, "Inside Job" by Charles Ferguson & Matt Damon, which I would like to add to the blog; it's goes through basic definitions of subprime loans, derivatives and how the 2008 financial disaster happened. Thought the financial terms would be good for all to know. The interviews are eye-popping. 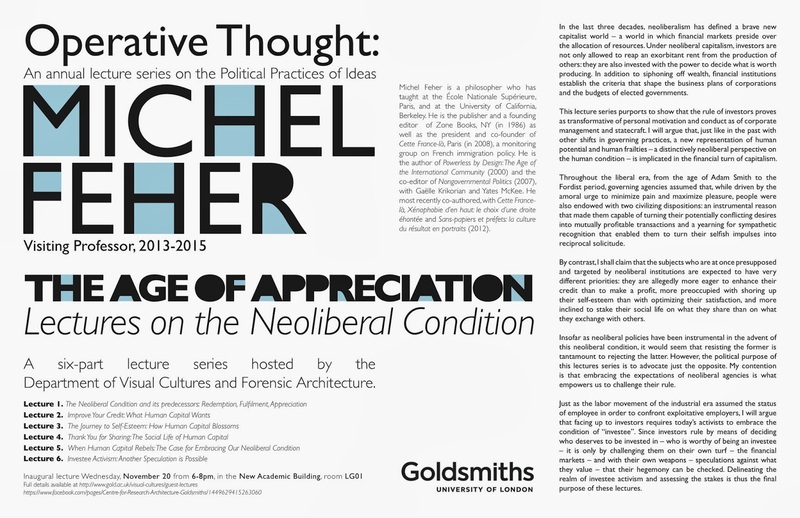 Michel Feher Lecture One 20.11.13 from Forensic Architecture on Vimeo. “Investee activism” involves identifying the specific mode of social antagonism defined by each financial market – stakeholder activism in the stock market, borrower activism in the bond market, collateral guarantor activism in the derivatives market – surveying the existing cases of social movements predicated on the investor vs. investee nexus – especially in the wake of the real estate and banking crises of 2008 – and speculating on the potential development of such activism.